This renovated and well-decorated vacation rental is equipped with all of the amenities of home and then some. 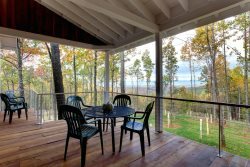 Located in an upscale neighborhood, and convenient to UVA and Downtown, this property features 4 bedrooms and 4 full size bathrooms, as well as an outdoor pool, treehouse, and furnished pool house that’s perfect for an extra place to mingle. There is a flat screen mounted TV in nearly every room of the house, including the kitchen and pool house. Outside you can escape to a large yard that even has a treehouse for kids to play in and enjoy the great outdoors. With the ample parking, large yard and around 2500 square foot of living space, this property can sleep 8-10 guests comfortably, with room to spread out as well. Definitely one of the best customer service I have experienced. Very pleasant to talk to, always eager and happy to help, very quick to take action (ie. replacement of kettle, toaster and sending plumber to fix blockage). Your team was awesome to work with! They were very helpful and pleasant. Our family enjoyed our week together at this lovely property. The grounds were nicely landscaped and the property was very private. We all enjoyed the pool and the extra space in the au pair cottage was used for puzzles, games, and World Cup viewing. Your team was great to work with and always very responsive and polite. The staff was great. Very accommodating and informative. Everyone was very professional and accommodating even through the wind storms! We were pleased with the property. We had a question about the heat in the au pair house and they were able to resolve the issue quickly over the phone. Perfect property for our group. The au pair house was a great space as well since one couple had a baby and this gave them a separate house so they didnt have to worry about the fact that she still woke up at night. The kitchen was well stocked with plenty of plates and lots of wine glasses. The location was also perfect with Food Of All Nations so close by as well as other stores within easy access. My daughter, a UVA graduate, liked the place so much that she is thinking about renting it with some friends and also recommend it to her co-worker. The yard with the treehouse and zip line was extremely popular with the children, even the 15 year old. And the golf course made for beautiful views including watching hot air balloons take off from it. It's very close to town and was so peaceful! Everyone was beyond helpful and friendly. Answering any questions and making recommendations for restaurants. Overall a very positive experience with your company and looking forward to returning sometime soon. very convenient and clean. We had so much fun and would love to return. We loved the whole experience! The Stay team was great! Very helpful and super efficient. I would definitely recommend working with them. We will be back! The house was great! Very private lot with a golf course view. Very spacious and the rooms were super comfy. Team members were very informative and helpful anytime I called. Follow up was good. Property was very good. Clean and as described on website. Had to call as there was no tea kettle and coffee machine was not working. Response after calling to replace both items was very quick, same day. Unfortunately there were no tea towels for drying dishes and bought one myself. Full inspection and testing of equipment after each rental would be helpful. Area was beautiful with great outlook to the golf course. Neighborhood safe for walking or running. Everyone I was in contact with from inquiry through booking to arrival was very helpful, pleasant and enthused about our stay in Charlottesville. The property was perfect for a reunion of UVA grads. The cozy living room furniture was arranged nicely for conversation, comfort and catching football games. The combined kitchen and dining area was perfect for gathering. Fully stocked with a nice collection of dishes, glassware and all essentials we had everything we needed at hand. I even snipped a few herbs from the garden to use for a cheese platter. The dining area table, seating and lighting created an inviting space that encouraged gathering throughout the weekend. The outdoor space had seating and encouraged gathering as well. We even snapped some group photos in the yard.The bedrooms were very comfortable and provided the right amount of light and storage. The bathrooms were functional and neat and provided all the essentials. We even spent time in the nice detached au pair suite with its own living/dining space and gas fireplace. All in all a very nice space, perfect for a fall reunion weekend.